The History Channel has changed over the years. I enjoyed watching the channel when it was focused on people and historical events, but now its schedule seems to be filled with all kinds of shows that stretch the meaning of history. "Engineering an Empire" and "Cities of the Underworld," have been replaced with "Pawn Stars," "Swamp People" and "Ax Men." I scratch my head and wonder about who are the target demographic audience for those shows. 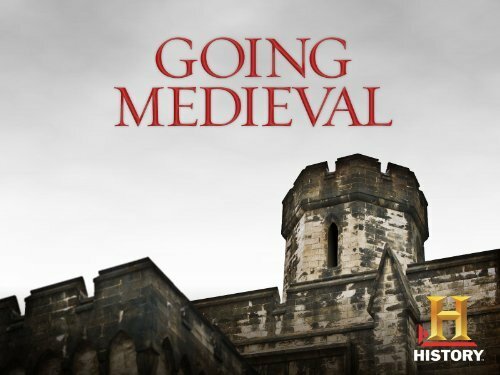 So, I was pleasantly surprised when a friend of mine told me about a show called "Going Medieval." I had to keep asking him to repeat the title, because I was confusing it with the names of the excellent medievalist blogs Getting Medieval and Got Medieval. A few months ago we downgraded our selection of channels on our satellite television, so we do not get H2 anymore. However, my friend told me that it was available for online download from Amazon.com and iTunes. He thought that the Amazon version might restrict portable downloads to their proprietary table Amazon Fire, so rather than risk being disappointed I went directly to iTunes so I could get it on my iPad. It was only $3.99. I thought that downloading it directly to my iPad was far more convenient than trying to watch the website to see if it might be rebroadcast on the regular History Channel and futz with programming my fickle DVR. I wanted to share with my blog readers that I thought the show was wonderful. "In this two-hour H2 special, historian and weapons expert Mike Loades goes medieval diving deep into the world of the Middle Ages. From the 5th to the 15th centuries, Mike battles the realities vs. the myths of this extraordinary time crusading for the core of real life while delivering fun-filled facts. From living, working and fighting to how to keep a knight's armor shiny using a vigorous rub of sand, vinegar and urine, Going Medieval is an expert account of life during medieval times." Yes, stale male urine was mentioned several times in the show. It was used in making soap and dying wool. Mike Loades demonstrates those domestic chores as well as plowing fields with oxen, hunting with hounds and falcons, and cooking a medieval feast. 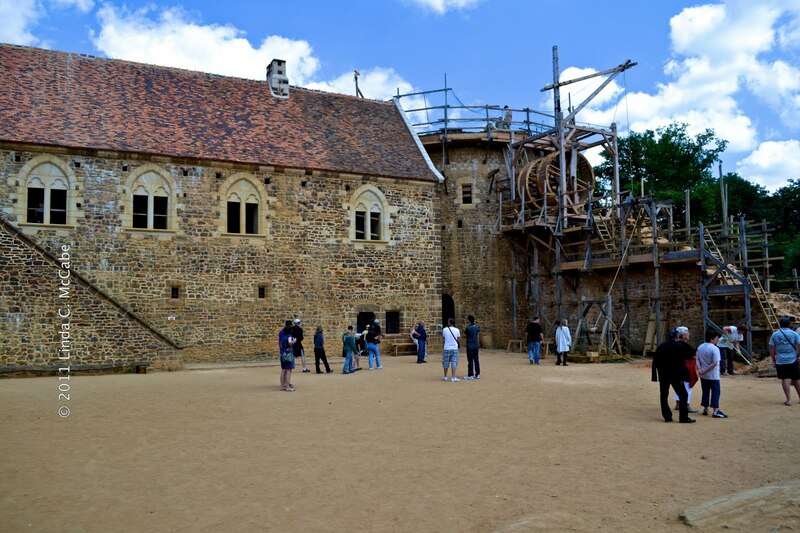 One of my favorite aspects of the movie is that a large portion of the show was filmed at the Guédelon castle project in France. 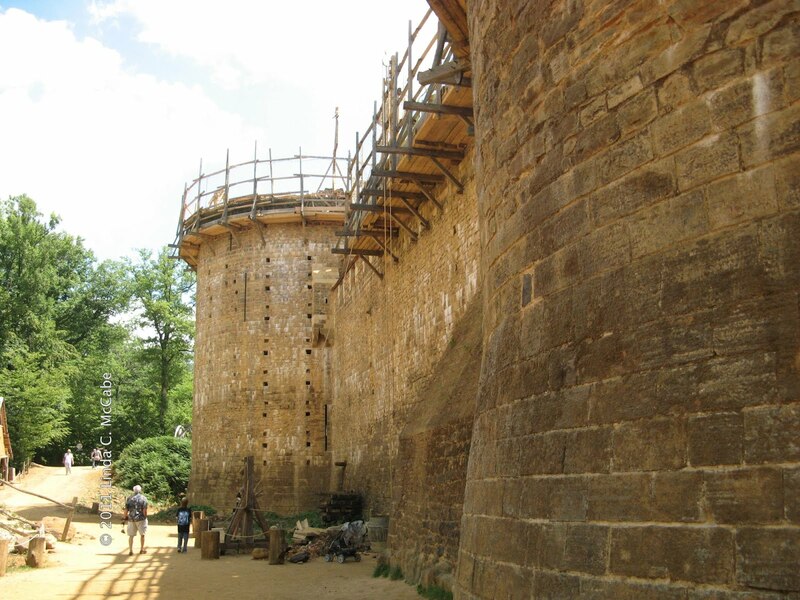 For those unaware, this marvelous project began in 1998 and they are building a castle with only the tools and techniques used in the thirteenth century. In fact, the masthead of my blog shows a picture taken during my first trip to Guédelon back in 2007. 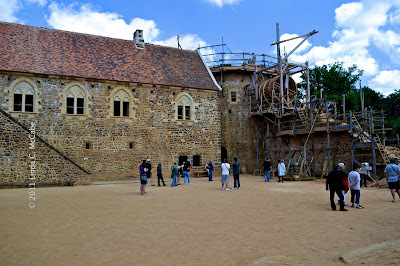 My first blog post about Guédelon can be found here. This past summer we visited the project again and here is a picture for you to see the progress made over four years time. Here is the other side of the same structure and you can see the tile work as well as two "human hamster wheels" used as cranes to lift heavy stones to the top of the building site. The host of the show was Mike Loades. 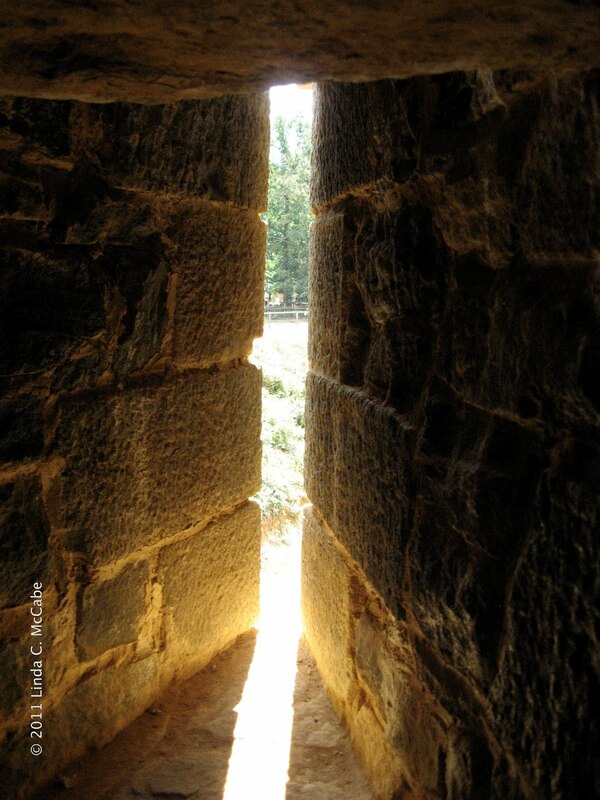 He and Gordon Summers demonstrated using Guédelon's archers' slits. I did not realize until this show that one had to stand several feet away from the slit in order for the arrow to go through a sinuous phase before it can fly outside. The two men took turns releasing their arrows and it was instructive as well as entertaining. For those who prefer the DVD format, the show will also be available in that manner at a much higher price. I recommend this show for my medievalist friends and believe you will not be disappointed. I believe it would be good for classrooms as well. One thing to note, since the DVD or downloads are commercial free, the running time is 1 hour and 23 minutes. Has anyone else watched this special? If so what are some of your thoughts? Or let me know if there are other specials you would like to recommend for people to watch or Avoid Like The Plague. Hi Linda....Thanks so much, for this Excellent email !! I have been watching these shows and find them fascinating and so interesting !! Love your photos and information !! Thanks so much !! Thank You for all the work you did in putting this email together !!... I Love it !! You must have a Medieval Maid, in your ancestry, to love doing all this research and passing on your info to us. "My Lady Linda" ..Sounds alright, doesn't it ? I enjoy hearing feedback from my blog subscribers to know that my posts are helpful and worth reading.